Don't miss the world premiere of the newly digitized Hula Hoʻolauleʻa, Traditional Dances of Hawaiʻi featuring rare footage of kumu hula ʻIolani Luahine. Join us for a talk-story session after the screening. 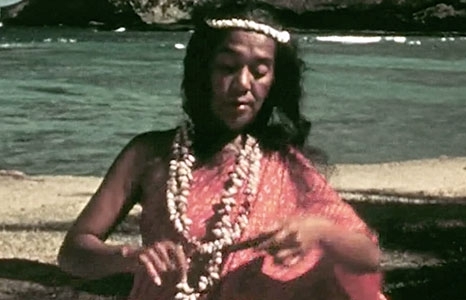 ʻIolani Luahine is considered to be one of the most legendary hula dancers of the 20th century. Her great aunt, Keahi Luahine, was a royal dancer from the 19th-century court of King Kalākaua. In honor of ʻIolani Luahine's legacy, and in partnership with Hula Preservation Society, the museum presents the world premiere of the newly digitized Hula Hoʻolauleʻa, Traditional Dances of Hawaiʻi featuring rare footage of kumu hula ʻIolani Luahine and the theatrical premiere of ʻIolani Luahine, Hawaiian Dancer on Sunday, Nov. 4 at 4pm. The films honor Luahine's legacy as the foremost practitioner of kahiko hula. This program is part of Ho‘oulu: The King Kalākaua Era public programming.